Seriously, Rand Paul, That's Your Go To? Last week, Rachel Maddow reported that parts of a speech by Rand Paul were lifted word-for-word from Wikipedia. Other groups did more research and found more plagiarism. He said some nasty things about Maddow, she went "say what?" Now he says that he can't answer the charges because duels aren't legal. "Yes, there are times when [speeches] have been sloppy or not correct or we've made an error," Paul said. "But the difference is, I take it as an insult and I will not lie down and say people can call me dishonest, misleading or misrepresenting. I have never intentionally done so." 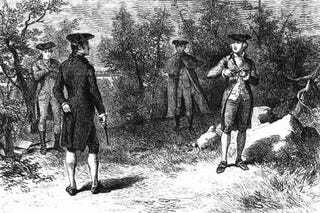 He continued, "And like I say, if, you know, if dueling were legal in Kentucky, if they keep it up, you know, it would be a duel challenge. But I can't do that, because I can't hold office in Kentucky then." There are these things called facts. Wikipedia entries have editing histories available, so we can tell when the text became the text that was used in the speeches. It is provable and proven that the text was written before the speeches and by someone other than the people responsible for the speech, thus plagiarism is proven. The appropriate response is something like "There was obviously a problem on my speechwriting team, which is being handled as an internal matter. In the future, all speeches will be rechecked for similar problems. I apologize to the original writers and assure you that this won't happen again." Instead he takes pointing out the problem as a personal insult and goes with "well, that woman hates me and I'd shoot her if I could still hold office afterwards" (paraphrased, obviously). Not "Well, that woman hates me and the proper response would be to challenge her to a duel, but killing is wrong. HAHAHA" Not even "Well that woman hates me and I'd shoot her if that wouldn't send me to jail." How entitled do you have to be that when someone points out actual bad behavior on your part for which you have designated fall guys, instead of dealing with the facts and using the fall guys, you make veiled threats of violence against a woman? He's totes pro-life, y'all! Unless you're an uppity woman! If you're an uppity woman and you point out his bad behavior, he should shoot you to death, only, then he couldn't be in Congress anymore. Let's face it. It's Maddow. He couldn't be on Congress because she'd probably win the duel.